This article was submitted from the USA in the early days of our website, so its information is now nearly twenty years old! However, some of the thoughts and comments are interesting and thought-provoking, and worth reading for now until we add newer information. "Me tumba una de esas frutas?" I asked the guide as I pointed to what I perceived was a fruit on which Scarlet Macaws (Ara macao) had been feeding. After looking at me without saying a word, as if I were a madman, he responded "No dede tocar esa fruta. Chamusca la piel". I knew that Hura crepitans is an explosive dehiscent, which bursts into a cloud of seed when ripe. But the fruit were still green. That was the stage in which the macaws were feeding and I wanted to look at them closer. Why would he not recommend that I touch the fruit and say that it would burn the skin? After a barrage of questions, I learned that the pod has a sap when green that if it comes into contact with the skin will burn it; in the eyes it can cause blindness. Tropical plants produce bitter, astringent, sour or poisonous substances to deter predation. Such defences are most obvious when the seedpods or fruit are green; if predated in such a stage the chances of generation diminish considerably. But once ripe the defences wane. 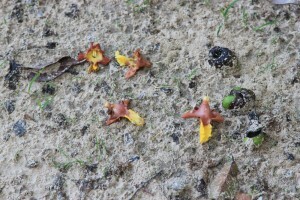 Predation is encouraged as a means of seed dispersal. A toucan, cotinga or other predator defecates or regurgitates the seeds after having eaten the fruit and this ensures the survival of that tree in the forest. An example well known to most inhabitants of the tropics is the Cashew (Anacardium sp.). Most people know the nut but few realize that it is attached to the outside of an apple-like fruit, which is juicy and delicious when ripe; if eaten green it puckers the lips, tongue and even throat. Most animals would find the ripe fruit irresistibly enticing, but the parrots go after the cashew fruit green. Their target is the carbohydrate, lipid and protein rich nut. By attacking the fruit green the parrot overcomes competition with other fruit predators, which wait for it to ripen, but it encounters alkaloids and toxins which could prove deadly. In many parts of Amazonia exposed cliff faces or riverbanks are known to be visited by a plethora of wildlife, including parrots. The animals come to consume the mineral laden soil. It is widely believed, at least in the neo-tropics, that the soil binds toxins (especially charged alkaloids like strychnine and quinine) and tannic acids with its kaolinite and smectite compounds and thus prevents death. To supplement minerals in the diet. Each of these points is worth elaborating. Foods are generally plentiful in parrot habitat; where other birds may be unable to survive, parrots thrive. Just look at the success of the Budgerigar (Melopsittacus undulatus) and Galah or Rose-breasted Cockatoos (Eolophus roseicapillus) in the barren Australian hinterland. Parrots, as in the case of Hura crepitans and the Scarlet Macaws, will eat fruits that are toxic; by attacking them before they ripen parrots are ensured a supply that would rapidly diminish and would have to be competed for once the fruit is in its prime. Two types of frugivores occupy tropical forests: seed dispersers like cotingas and seed predators like parrots. Parrots cut and crush their food; it is partially macerated once it reaches the crop. A cotinga, for example would need grit in its crop to erode the sometimes hard fruits they consume whole. Parrots have no need for grit. Besides, the soil, which is consumed, is too fine to provide the abrasive qualities needed. Parrots do not rely on bacteria for digestion as do ungulates or even the Hoatzin (Opisthocomus hoazin), a unique bird usually found along watercourses and which feeds on plant leaves. Both ungulates and Hoatzins feed on acid and fibre rich foods, which they must buffer so that it does not kill the bacteria needed for digestion. Parrots practice Geophagy, I believe, to nullify certain toxic compounds. It is interesting that my field observations have shown that colas or barriers, as areas where they are seen eating soil are called, are visited principally by species which feed on one form or another of toxic plants, fruits or pods. Possibly they also eat soil for another reason: to consume minerals. Amazonian forests are mineral poor. This is seen after an area has been deforested, where slowly the grass or trees planted perish unless heavily fertilized. 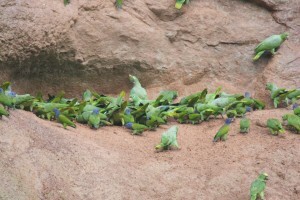 Areas visited by parrots for Geophagy are mineral laden when compared to the surrounding areas. (Humans know such fact also. Near Uzalla, Nigeria, some 500 tons of earth are extracted yearly. The soil is sold throughout many areas of West Africa, where it is eagerly purchased and consumed by pregnant women; a mere 28 grams (1 oz.) provides the daily allowance for iron recommended by the Food and Drug Administration of the US and also a third of the daily requirements of copper.) Where the parrots feed on toxic compounds and soil is not available, they may turn to terrestrial termitaria, as do Yellow-faced Amazons (Amazona xanthops) in the southern part of its range. The termitaria contain up to 500 times the mineral concentration of the surrounding area. By ingesting it, the parrots not only nullify the toxins but also receive the needed minerals. (I have often wondered why Australian and African aviculturists do not provide chunks of termitarium to their birds as a natural mineral source.) Finally parrots, I do not believe, consume earth to stop diarrhoea; their faeces merely reflect what they have eaten and may range from solid to very runny. I have never seen what could be described as "diarrhoea" in a wild parrot. Parrots are opportunistic feeders in the wild. They consume fruits that are not yet ripe and their breeding often coincides with a flush of a specific food resource. Puerto Rican Amazona (Amazona vittata), for example, nest when Prostea Montana palms are fruiting most heavily. In Miami Beach, Florida, where I live, a small feral flock of Severe Macaws (Ara severa) nest when the many introduced China Berry (Melia azadarach) are fruiting. Ensuring a rich supply of a small, greenish berry that few other birds even bother looking at; like many of the foods this species consumes in the wild, is toxic - crushed dried berries repel fleas and when mixed with water (1 teaspoon of crushed berries, 1 teaspoon of detergent and 1 gallon of water) produces a superior flying insect repellent! Some parrots consume a great variety of foods in the wild. This is easily explained in that in the tropics tree species do not grow in dense stands but are scattered, often wide apart. Such separation reduces the risk of an insect predator from devastating that species. The parrots feed on what is available within their home range. Others come from areas where trees grow in distant stands. Hyacinth Macaws (Anodorhynchus hyacinthinus) and specific palm tree species in different parts of the range are typical. The palms grow in stands distant from one another, the intervening area reducing the risk of predatory insects or pathogens from wiping out the entire species. Now that most of the products fed to parrots have been ruled out, what should our parrots be fed? Current thinking suggests that the diet for captive parrots should comprise of pellets and vegetables. Breeding birds should receive a 20-27% protein level and non-breeders a 16-19% protein level. Seeds should be excluded, except in small amounts, because they unbalance the diet; most seeds are deficient, for example, in lysine and methionine, two of the 10 essential amino acids needed by parrots; the others are arginine, histidine, tryptophan, threonine, leucine, isoleucine, valine and phenylalanine. An occasional seed has been advocated by some for psychological reasons, but in reality this need can be met by many other means, including fresh branches, toys (yes, toys which are enjoyed even by some breeders) and pine cones, to mention just three. Seeds are therefore not necessary, but they can be a convenient treat. Nuts must be included in the diets of large macaws. These can range from the drupes of the Queen Palm (Drecastrum romanzoffianum) to macadamia nuts. They provide the necessary fat that these birds require. Vegetables should be selected to ensure they are high in vitamin A. The ratio should be about 80-90% pellets to 10-20% vegetables: if fruits are believed necessary then they should comprise of no more than 5% of the diet and should comprise of tropical varieties, such as ripe mango or papaya, which are nutritionally superior to temperate fruits like apples, pears or grapes. Table food can be given sporadically as treats. Pasta and rice are usually readily taken and should be salt free; other foods, if used, should be non-salt carbohydrates. Controlled tests using pellets have revealed that when used they can produce superior results. Ideally pellets should be extruded; this process kills pathogenic micro organisms and deploymerizes starches making them easier to digest. Pellets can be coloured and of different shapes and textures to provide variety. Conversion to pellets is not difficult. Pet birds are simpler to convert because the owner can pretend to participate in eating the pellets or hand-feed them, but even aviary birds are not onerous to convert. Pellets can be crushed and sprinkled over wet greens or fruit, can be offered in a shallow bowl with canned corn sprinkled on top, or can be sprayed with a fruit juice. Conversion should be slow to reduce stress; taking 2-3 weeks in recalcitrant cases is not unusual. Most birds, however, convert within a matter of a few days. When converting birds to pellets, note weight (if necessary catch and weigh the birds) and realise that because there is virtually no waste, less will need to be fed and less will be eaten. In my experience with a broad array of species, I have never known of a bird that refused to convert and which did not readily eat the pellets once converted.